Yewbarrow is one of the most shapely of the Lake District fells, taking the form of an upturned boat, with steep slopes on every side and a dramatic pointed 'bow' facing south towards Wast Water. This was the last of the Wasdale fells I reached the top of, only managing it after I found the obscure path up the western slopes. The most dramatic crags are at the northern end of the fell, where they drop 1,000 ft in the same horizontal distance down into Mosedale. Just to the north-west of these crags is Dorehead Screes, once a famous scree run but now eroded away and a rather nasty route. The summit area couldn't be any more different from the slopes. Here exposed rock and crags are replaced with undulating grass, and a long fairly level ridge that allows easy walking from one end to the other! Yewbarrow is a great viewpoint for Wasdale and Wast Water, with some of the best full length views of the lake and the screes, and a great view down into Wasdale Head. It stands just far enough away from the surrounding higher fells to offer good views of them, although more distance views are generally blocked by those same higher fells. The longest views are west, down the valley and out to sea. There are are three recognised ways up Yewbarrow - two well known but quite tricky and one more obscure but easier. 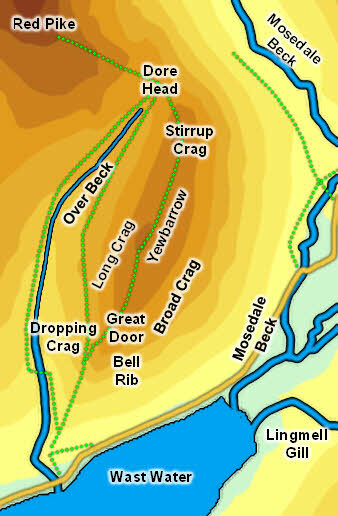 The best known routes are at the two ends of the fell - up the southern ridge via Great Door or up the northern end at Stirrup Crag. Of these the Great Door route is steep, and sometimes exposed, but will be OK for most. In contrast the Stirrup Crag route is a climb, not a walk, and involves a significant amount of scrambling up very exposed rock. The easier route is in the middle of the western side, but is easier to find by starting from the Dore Head direction. From here head south along the lower edge of a series of scree slopes. Just before the southern edge of these screes look for a cairn on a boulder. This marks the point where the path turns east to head up towards the foot of the crags above. At the base of the crags the path turns right and runs along a ledge between the screes and the crags, eventually reaching the summit ridge close to the low point between the two summits. We have one ascent of Yewbarrow, using the middle path. Yewbarrow has two summits on the long summit ridge, one at the northern end of the fell and one just to the south of the half-way point. The southern summit is the higher of the two. From the north it appears as a grassy pike, from the south as more of a rounded summit, on the wide ridge that runs up from Great Door. The top itself has some exposed rock, with crags to the west and fairly easy grassy slopes to the east (handy if you want to avoid climbing over the summit more than once). Over Beck runs along the western side of the fell, rising just south of Dore Head and running south into Wast Water. Mosedale Beck runs along the eastern side of the fell, also eventually running into Wast Water after merging with Lingmell Beck. One minor un-named beck runs down the southern side of the fell, and runs into Wast Water close to Mosedale Beck. Yewbarrow has no major tarns (although there is a small pool on the summit ridge), but it does have just under a mile of Wast Water as its southern border.